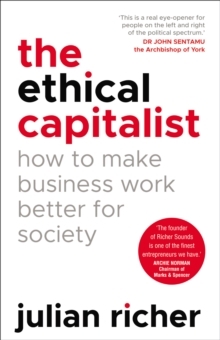 __________________*A road-map for a kinder, fairer capitalism that is fit for the 21st century*Financial Times Book of the Month`The founder of Richer Sounds is one of the finest entrepreneurs we have.' Archie Norman, chairman of Marks & Spencer__________________Capitalism has lost its way. Every week brings fresh news stories about businesses exploiting their staff, avoiding their taxes, and ripping off their customers. Every week, public anger at the system grows. Now, one of Britain's foremost entrepreneurs intervenes to make the case for putting business back firmly in the service of society, and setting out on a new path to a kinder, fairer form of capitalism. Drawing on four decades of hands-on management experience, the founder of Richer Sounds argues that ethically run businesses are invariably more efficient, more motivated and more innovative than those that care only about the bottom line. He uncovers the simple tools that the best leaders use to make their businesses fair, revealing how others can follow suit. And he also delves into the big questions that modern capitalism has to answer if it is to survive and to thrive.